250 records – page 1 of 13. 1 photograph: b & w; 24 x 13.5cm. Photograph taken towards the Babines. 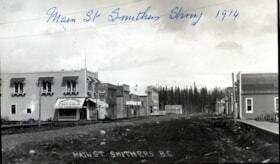 Government Liquor Store on Smithers Main Street. 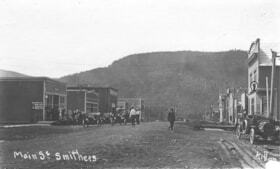 The Government Liquor Store and a dress shop on Smithers Main Street. 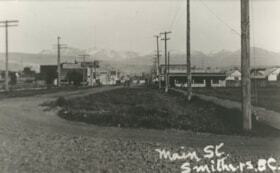 Looking down Smithers main Street from just in front of the train station. 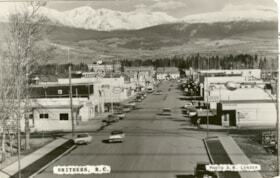 Main Street parade, Smithers, B.C. Title based on image content and information written on the back. 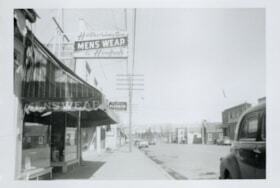 Seen in photograph: A.C. [Stewarts or Stewart's] Fashion Shoppe and a Barber Shop. 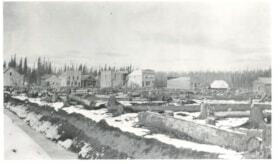 Written below in pencil: "Museum, from Irma Bannister"
Written on the back of the photograph in pen: "old parade, old buildings along main drag"
Title based on the image content and on information written on the back. 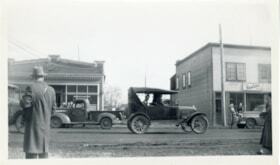 Written on back of photograph in pen: "Old Ford in parade"
Title based on postcard title, and postcard contents. 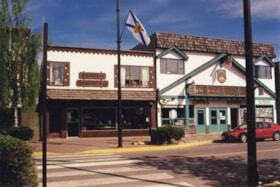 At the end of Main Street is the Central Park Building. On the left side of Main Street: Oulton's Heating, Martin Electric, Hetherinton and Hooper Mens Wear, The Salon Shoes, Ray's Shop-Easy, and [?] Cleaners. On the right Rexall Drugs, Interior News, and Marshall Wells Paints. 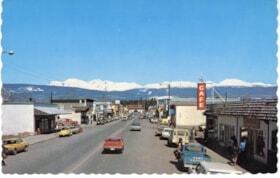 Back of postcard: "Smithers, British Columbia 'The Yellowhead Route' - Highway 16. 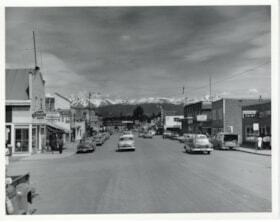 The Main Street with a picture window! Photo by Dorse McTaggart"
Dorse McTaggart holds copyright to image. Title based on information written on photo album booklet. 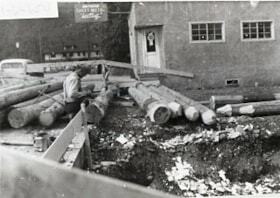 Hetherington & Hooper Mens Wear, and Smithers Pluming & Heating can be seen in the photo. Photo is 2 of 5 in the album. 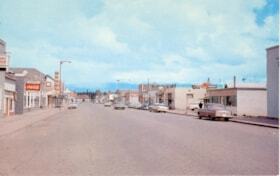 Photo is part of a small print album of 5 photographs printed by Album Photo Service in Regina, SK. Written on the back is "Sandy Gazely"
Wall's Electric opened in 1944 when Al Wall took over the business from Al Evitt. 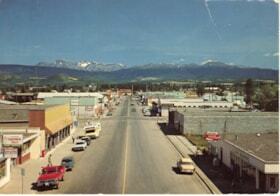 Wall came to Smithers in 1937 and in 1958 furniture was added to Wall's Electric. 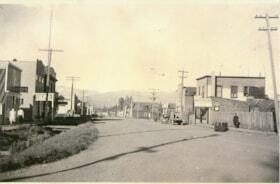 On back of postcard is written: "J Beniston. Dist of Coquitlam Sicuak Wekfare Deot, 640 Poirier Av. N.W. Phone We 9 9242"
1 photograph: b & w; 12.5 x 9cm. 1 postcard: colour; 13.5 x 8.5cm. 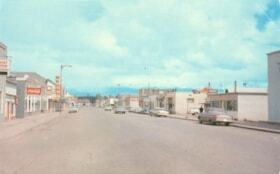 Jim Kennedy also (at one time) owned a pool hall, fruit store, and circulating library. The first issue of the Interior News came out in 1909 and it's editor/owner was Joe Coyle. 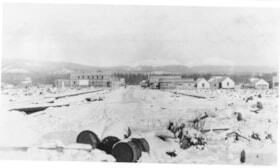 J. Mason Adams' Drug Store can be seen on the left in the photograph.